When a friend of Mr R’s mentioned that she had the Timeout Black card and could get 50% discount at Bo Drake, he quickly checked the diary and popped a date in. When the dinner finally came round, we realised that despite the fact that it was Pan Asian-y food, we didn’t know much else. Mr R and I arrived slightly later than Miss PC and Mrs R-T who were already seated when we rocked up. Covered in scaffolding, the restaurant was slightly camouflaged and when we entered, we were greeted by an equally industrial atmosphere with bare brick walls and funky lights. The restaurant was fairly minimalist. Shortly after sitting down, our waitress came over to take out drinks orders, after some confusion (Mrs R-T was having an indecisive day, to vodka or not to vodka, that is the question..) we set to looking at the food menu. Knowing Mr R and his habit of over-ordering, Miss PC insisted on ordering enough with the plan to order more should we require it. What started off as 3 starters, quickly increased to 5 and similarly 2 mains increased to 4 + 2 sides. To say our stomachs were doing the ordering wouldn’t be a lie. Having placed the order it wasn’t long before our starters made an appearance. First up the Pork Belly Bao, Korean Fried Chicken (KFC) and the Bulgogi Sliders. I’m slightly biased when it comes to Bao as I love the soft fluffy bread and would happily eat most things if they were served within one. The Pork Belly Bao did not let me down. The pork belly itself was tender and well cooked without being fatty, a great sign. 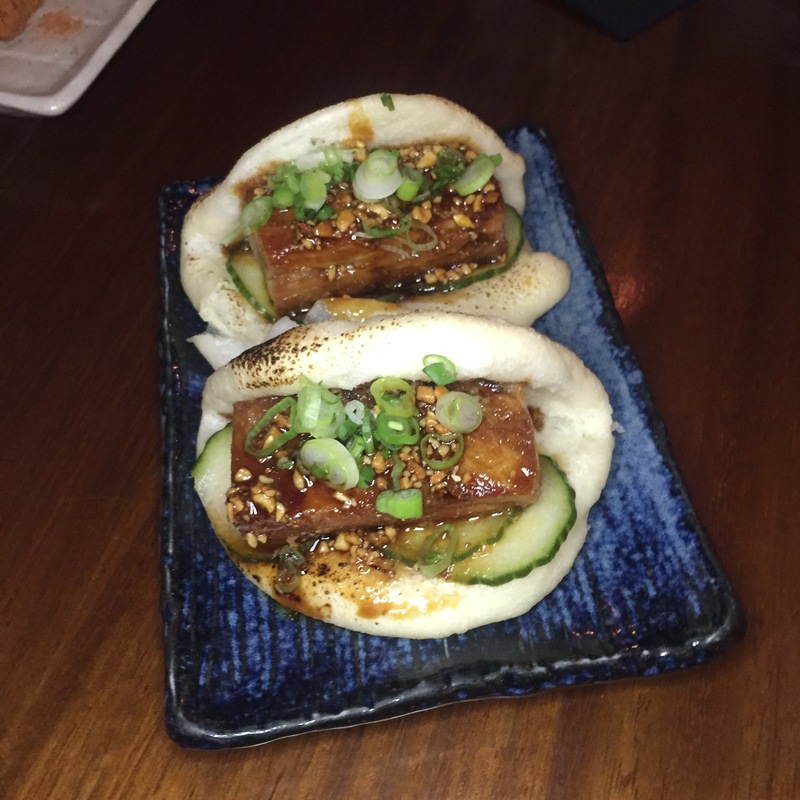 The bun filling was accompanied by pickled cucumber, spring onion, sesame seeds and soy glazed peanuts, all of which added to the overall flavour. The Scallop Sashimi was nicely presented, served on a saffron rice cake and topped with wasabi mayo. The sashimi itself was fresh, but slightly lacking flavour and the overall dish was overpowered by the rice cake which didn’t have a strong saffron flavour, or I just didn’t go looking for the saffron. Kimchi Pancake was topped with mozzarella and resembled some kind of Korean pizza. Whilst I get that this was a quirky twist on a traditional kimchi pancake, I’m not entirely sure it enhanced the dish, perhaps if they’d left out the reference to the kimchi pancake I may have taken to the dish slightly more. Don’t get me wrong, it was a perfectly nice dish, just not when described as a kimchi pancake topped with cheese. Next to arrive were the Bulgogi Sliders and the Korean Fried Chicken (KFC). I was slightly underwhelmed by the Bulgogi Sliders. The meat was well cooked and the burger bread itself was well toasted, but the overall dish lacked flavour and perhaps a little seasoning. The Korean Fried Chicken, on the other hand, was fantastic, a firm favourite for all, including Mr R. We received a bowl of around 10 chicken wings, that were perfectly seasoned and fried until crispy then tossed in some kind of sauce which to me tasted a bit like a watered down plum sauce with a splash of rice vinegar and some chopped rosemary. Strangely the dish was garnished with some grapes but Mrs R-T didn’t complain and happily chomped away on the healthy accompaniment to the fried goodies. Having demolished the started, our mains started arriving. 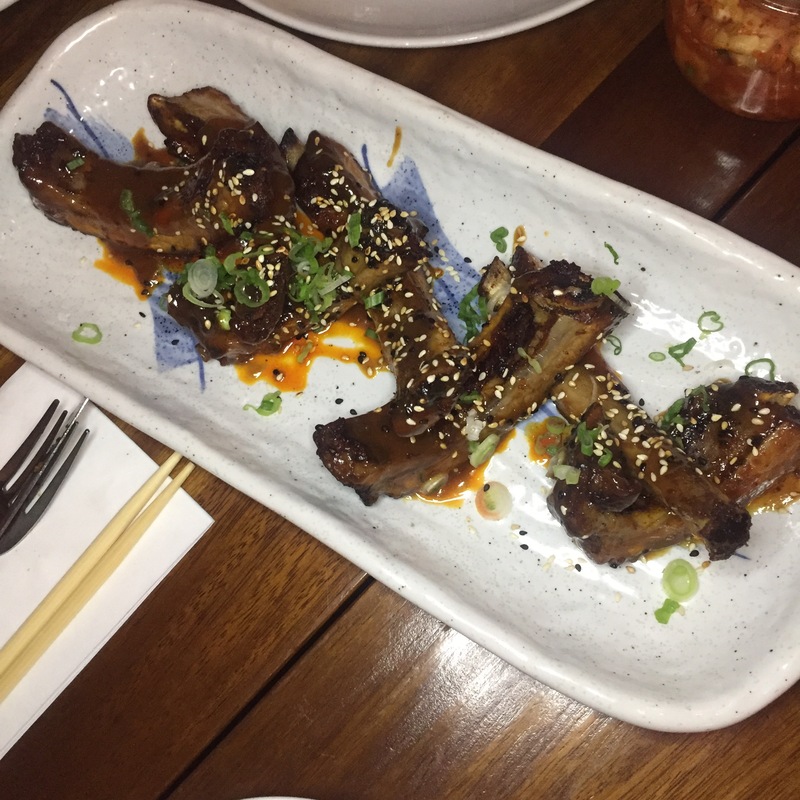 The Miso Glazed Baby Back Ribs, smoked with apple wood, Lamb Cutlets served with burnt aubergine and gochujang demi glaze and the Spicy Crispy Squid were first to hit my plate. The ribs I tried were slightly lacking meat, however, the flavour was distinctly smokey with some a cheesy undertone. It was a strange mix but kind of worked. Again a healthy portion with about 8 pieces arriving on the dish. The Lamb cutlets were equally good, with the portion consisting of around 4 pieces. The flavours were good, however, the burnt aubergine was slightly under seasoned. The lamb itself was extremely tender and the glaze added an extra dimension of flavour. The crispy squid was indeed perfectly crispy and didn’t taste that dissimilar to the squid we had tried at Hoppers. It had been tossed in some kind of spice mix which added some extra flavour and made for a good dish overall. The sweet potato fries with kimchi island dressing was next onto my plate and by golly these were good. The tasted vaguely cheesy, a bit like nacho cheese but with a kimchi flavour. The fries itself were crispy and well-seasoned. The bowl remained firmly within reaching distance, somewhere between Miss PC, Mr R and myself. The black sushi rice risotto (with squid ink and cuttlefish) was Miss PC’s choice. I must say it’s not something I would have ordered otherwise, but I was pleasantly surprised. Although it did have a slight fishy taste, it wasn’t dissimilar to a congee and left you going back for more. Mrs R-T was still mesmerised by it the next morning, so that’s really saying something. The house kimchi was an interesting take on kimchi where the chilli kick usually found in kimchi was replaced with a hot gingery flavour. I personally quite liked the outcome. Sesame Oil Soft Serve Ice Cream with Toasted Sesame Seeds on the left & Sake Tiramisu on the right. The soft serve was actually delicious. The thought of topping a 99p flake (minus flake) with sesame oil and toasted sesame seeds would never have occurred to any of us, however, the outcome was pretty amazing. I would have loved a little more sesame oil but beggars can’t be choosers! The tiramisu was slightly disappointing. The sponge used wasn’t quite as soggy as expected, the sake flavour wasn’t too strong and it was topped with far too much cream. The general atmosphere is pretty kool and had it not been a quiet Tuesday evening, I’m sure there would have been a real buzz making it a trendy dining venue. With the 50% offer, we were able to try a hell of a lot of food and still end up with a reasonable bill, however, at the full price, Mr R would have been disappointed to have spent that amount as he still walked away feeling slightly hungry. All in all, Bo Drake would be perfect for a Birthday dinner or something a little bit special when you’d be ok to spend a little more and get a good atmosphere in return. Although the space is fairly small, dining in a group would be the ideal scenario as unlike a lot of similar restaurants, the portions are pretty generous and you’d also have the opportunity to try more of the menu.